Review: Cherry Jones and Zachary Quinto in a Heartbreaking "Glass Menagerie"
A seven-story fire escape is the first thing you notice on the set of “The Glass Menagerie,” which has opened at the Booth Theatre after a lauded run at the American Repertory Theater outside Boston. The steel stairs spiral to the sky, each platform growing smaller and twisting as the steps soar toward the heavens. The fire escape is where family breadwinner Tom Wingfield (Zachary Quinto, in his Broadway debut) goes to smoke and avoid his conniving mother, Amanda (Cherry Jones). And it’s where daughter Laura (Celia Kennan-Bolger), who wears a metal brace on her foot, ushers into the home her unrequited high school crush, Jim (Brian J. Smith), the gentleman caller of Tennessee Williams’ semi-autobiographical play. Set in the same Depression-era St. Louis where Williams spent his early days, “Menagerie” is bookended by monologues from Quinto’s Tom, who yearns to be a merchant seaman. Tom is held back by his sense of responsibility to his family, especially wounded Laura, whose disability has left her isolated from the real world. Tom contents himself with trips to “the movies,” heading down the same hard-drinking path as his father, who deserted the family years ago. The transition from Tom’s present-day story-telling to the flashback that begins this ensemble piece comes as a surprise, an effective bit of stagecraft that’s all the more powerful for its simplicity. Much of the production feels spare; even meals set at the family table lack any actual food. 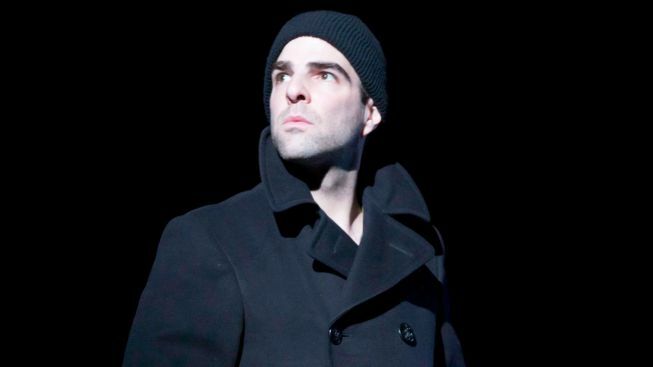 Taller and with more sullen features than his co-stars, Quinto conveys both the pain of his own abandonment and the pressures of caring for the women in his family (there are, so help me, flashes of his Sylar, from TV’s “Heroes,” in one early confrontation with Amanda). His performance, brooding and self-aware, allows you to experience Tom’s turmoil: the contradictory knowledge that to save himself, he needs to desert the ones he loves most. Quinto’s Tom isn’t so much “selfish,” as Amanda will accuse him of being later on, as he is an iron-jawed survivor, plain and simple. Jones, in the months leading up to this opening, left us with the sense she never wanted to play the complex Amanda, but allowed director Tiffany to persuade her. Thank goodness. Her forceful matron is bullying and boisterous, motherly and affectionate, deluded and desperately needy, without ever quite coming off as detached from reality. That, even as she tries to raise up the physically and emotionally damaged daughter she is simultaneously suffocating: “Why, you’re not crippled, you just have a little defect," Amanda tells Laura, continuing on that she can make up for the disadvantage with just a little "charm." While Tom drinks to escape his problems, Laura, with her lame leg and “inferiority complex,” can retreat only to her tiny glass figurines, the inanimate objects she has anthropomorphized. Her “menagerie” is represented by only one figurine, a delicate unicorn. Sometimes, when Keenan-Bolger grasps the piece, the light shines through, illuminating a spot on her face. It’s a pretty cool effect. Keenan-Bolger holds her chin high through every disappointment. Her face remains blank, but she carries the weight of her burdens in hunched shoulders. Laura's low self-esteem drives the action in "Menagerie," though by the end of this production, Keenan-Bolger will have you second-guessing just who among the Wingfields is truly the weakest link. Her Laura is frail, but not yet so lost to despair that she is unable to take risks. This is also, alas, when Jim must disappoint Laura, in spite of a shared kiss, with the reality of his commitment to another woman. Laura repays him with a wholly unselfish and grounded act of kindness, the story’s saddest moment. The “gentleman caller” is that thing we hope for that just isn’t to be. Smith plays it spot on, not devoid of youthful hubris, but no lothario, either. Just a decent guy who falls momentarily prey to his hormones. As “Menagerie” moves toward its conclusion, Amanda confronts Tom, suggesting he must have known the suitor was unavailable. It’s this altercation that finally ignites the combustible Wingfields. We suspect, going in, that “The Glass Menagerie” is likely to leave us wrung out. It does, but we arrive at the climax in exciting new ways. It’s a remarkably satisfying trip to a disturbing destination. “The Glass Menagerie,” at the Booth Theatre, 222 W. 45th St., through Jan. 5, 2014. Tickets: $77-$137. Call Telecharge, 212-239-6200.